Starring Tim Kalkhof, Sarah Adler, Roy Miller, Zohar Shtrauss, Sandra Sadeh, Stephanie Stremler, Tagel Eliyahu, Tamir Ben Yehuda, Eliezer Shimon, Iyad Msalma, David Koren, Gal Gonen and Sagi Shemesh. Screenplay by Ophir Raul Graizer. Directed by Ophir Raul Graizer. Distributed by Strand Releasing. 109 minutes. Not Rated. Oren is a man who cannot cook but loves to eat. In this story centered on love, grief, and food, Oren is lucky to have a wife, Anat, who has just opened a café in Jerusalem. And a lover, Thomas, in Berlin who is an accomplished baker. Oren travels monthly on business to Berlin and always stops by the bakery for his wife’s favorite cinnamon cookies. Thomas is unassuming and quiet, raised by his grandmother in a German bakery to be appreciative of what he has. He and Oren develop a romance that blossoms into a love affair in their pockets of monthly time together. When six weeks pass with Oren not returning his calls, Thomas goes in search of his love, to be told that there was an unfortunate accident and Oren is dead. Overcome with grief, Thomas leaves Berlin and travels to Jerusalem, presumably to return the keys Oren left at his flat, but does not leave and instead, seeks out Anat’s café. What may read like a stalking situation is really part of Oren and Thomas’ intimacy. They spoke of Oren’s life – his wife, his son, his work. Although it seems a bit awkward as an outsider looking in, it really feels like this very well could be what Thomas would do in this time of grief to help him to process his loss. He shows up at the café and appears to be a student. A German, in Israel. Even in present day, this was a point of suspicion for Oren’s orthodox brother. But Anat is more accepting and frankly, a bit more frazzled and on a particularly overwhelming day, she agrees to give Thomas a job as a dishwasher, looking only for some assistance as she tries to make due raising her son and running her café. She knows nothing about his culinary skills, and Thomas seems content to just be a part of this period in his own way, sharing in her grief while working through his own. Eventually, Thomas begins to show off his baking skills and the café’s business grows with the German pastries. 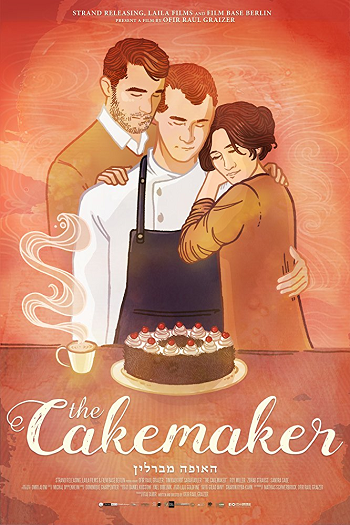 The Cakemaker is quiet and subtle with a moving soundtrack and captivating storyline. There is always the tension of the other shoe about to drop, waiting for the moment that Anat figures out Thomas’ relationship to Oren and to herself. The film held my attention late into the night and led me to reach out for a midnight snack – Thomas’ baking will leave you hungry. Copyright ©2018 PopEntertainment.com. All rights reserved. Posted: July 6, 2018. Tags: Bonnie Paul, David Koren, Eliezer Shimon, Gal Gonen, Germany, Israel, Iyad Msalma, movie review, Ophir Raul Graizer, PopEntertainment.com, Roy Miller, Sagi Shemesh, Sandra Sadeh, Sarah Adler, Stephanie Stremler, Tagel Eliyahu, Tamir Ben Yehuda, The Cakemaker, Tim Kalkhof, Zohar Shtrauss. Bookmark the permalink.